What is the driving project? The driving project had many aspects to it, it helped students dig deeper into critical thinking and try new things when it comes to math. At the beginning of the project, we started to form our question and refine it until it was something that is interesting, challenging, and specific. Something that helped us finish strong and come out successful was the 5 step process to find an answer to your research question. The order goes ask a good question, create a mathematical framework, do the math, reflect on your results, and look it up. My process was hard and easy but in the end, I felt good about the work I put out. Frist, I formed a question that was unique but also a little challenging. My question was if you were going a certain mph and you apply the breaks how many feet will you go until you come to a complete stop? I asked Dan what the equations that I would use to solve this problem the equation was, d=vi*t+1/2(a)*t^2. Then I started choosing numbers that are realistic in this situation and started doing the math. What was hard is I didn't get a clear answer because my question was as specific, so I just got numbers for h​ow many feet you would go at different mph. 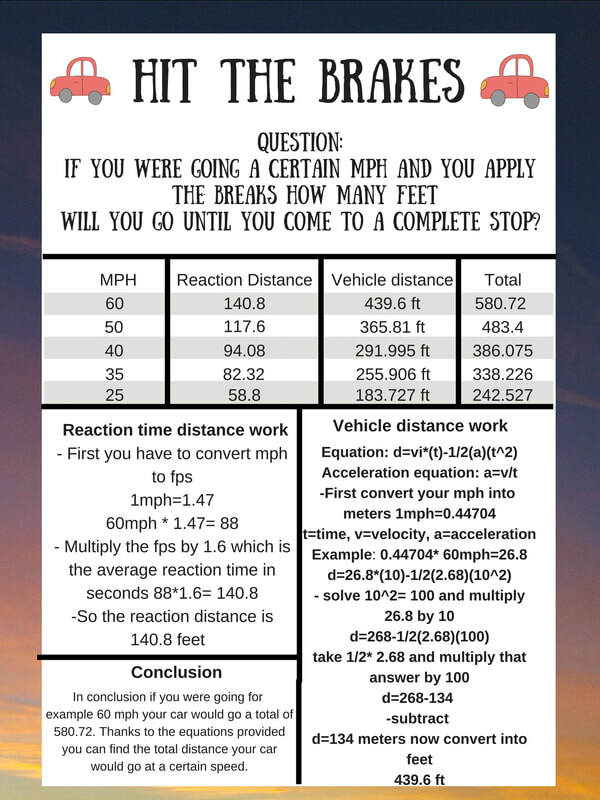 To go farther into this question you could add different variables like how hard you are hitting the breaks how many cars are in front of you, car weight, etc. You could go deeper into it by being more specific like your speed. I feel good about my work it was something that was definitely challenging which is good because I learned a lot. What I would refine is to go deeper into the research by adding other variables. If I did add other variables I would learn a lot more than I did.